For those of you wondering why this is a big deal, it’s because although Singapore and Alaska have been partners for years now (and you can use Singapore KrisFlyer Miles to book flights with Alaska), Mileage Plan hasn’t shown the slightest urgency in making Singapore flights bookable with Alaska Miles. Given the tremendous award redemptions that Mileage Plan allows on other partners like Cathay Pacific and JAL, being able to use Alaska Miles on Singapore Airlines could be great news. 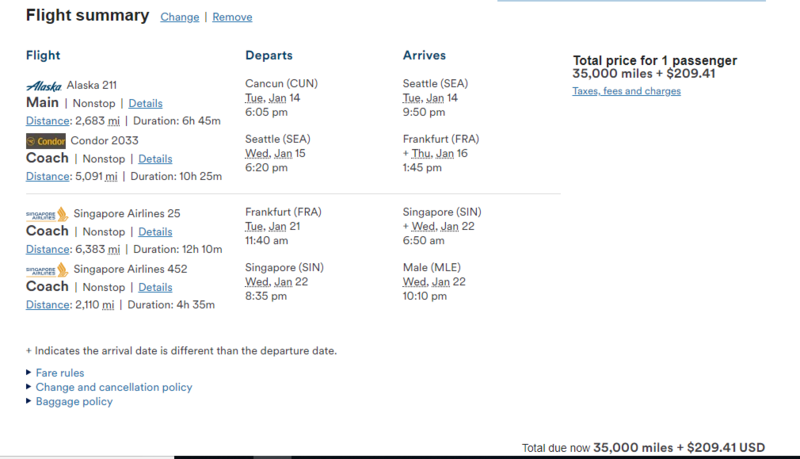 I haven’t had time to do thorough research, as I wanted to share the news (so there may be other routes available), but the only way I could get Singapore Airlines space to appear was when searching for flights specifically between the Maldives and Cancun (or vice versa), with a stopover in Frankfurt. 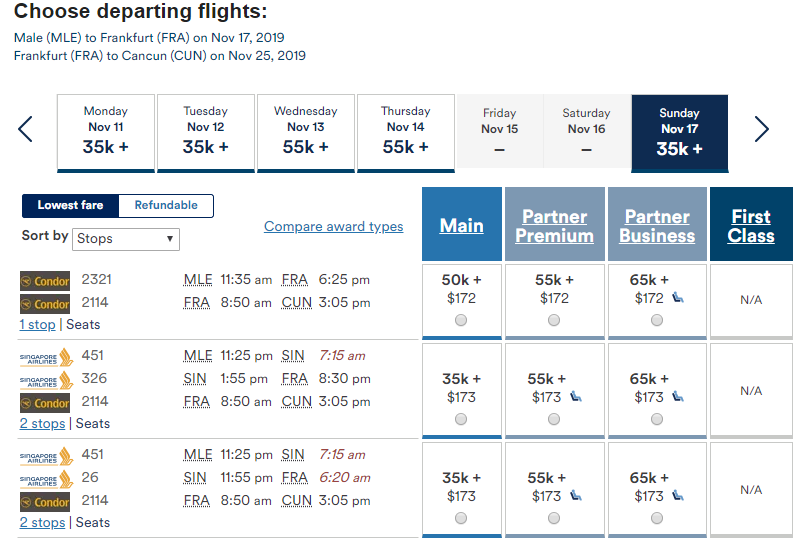 I’ll explain more about how the Frankfurt stopover works in tomorrow’s post about Condor, but I’m sure those of you familiar with Alaska Mileage Plan can already see what I’m getting at the examples above and below. 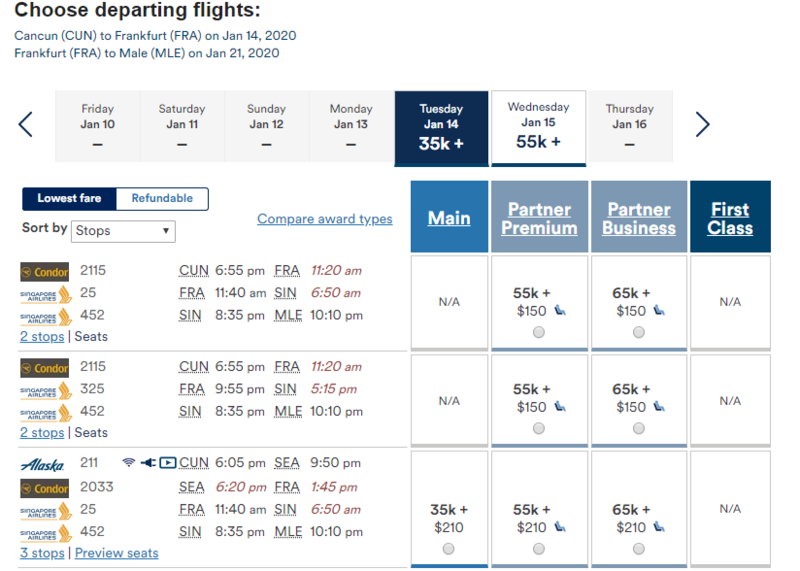 I have really no idea at this point whether this is the start of Alaska adding Singapore Airlines award space fully, an old experiment they’ve forgotten about, or just a very odd unintentional glitch. 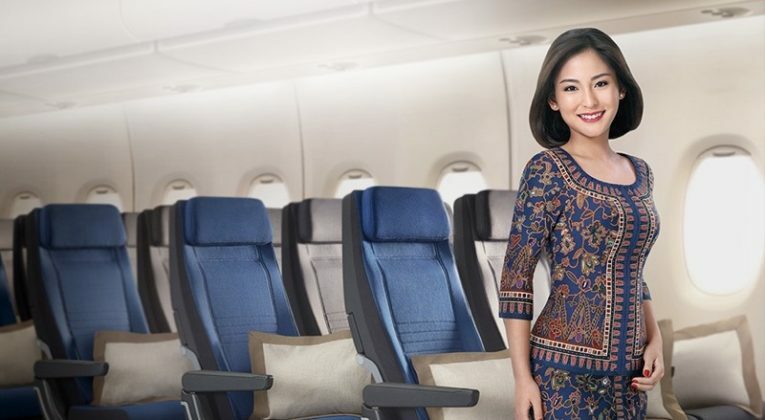 If you have any info on this, or notice any other examples of Singapore Airlines space popping up on Mileage Plan, please share in the comments! When everyone starts booking it they may soon realise. In passing a spotted some other great mileage opportunities. Great article. Amy chance of using Emirates Skywards on Singapore airlines? (I also have some Krisflyer miles). What’s more shocking about this is the fact that mix partner one way awards are showing up. Alaska has NEVER allowed 2 partners to be combined on a one way itinerary! Yep – it’s very, very odd.